In Estanc we have made a very concrete commitment when it comes to wages, extrinsic motivation. The promise is to pay our employees at least market average +10% and to have a quarterly motivation system on top of that. We think that this is foundational to being a sustainable company with the best talent. At the other and more important hand, we truly believe that what makes someone a member of #EstancTeam is the importance of shared soft, intrinsic motivation. 100% of Estancian is put together by 49% of technical abilities and 51% of right attitude – shared purpose, vision and values. 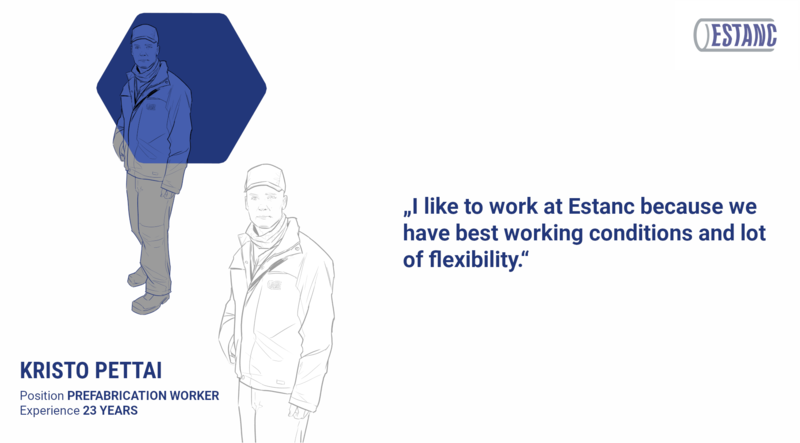 Since creating a supportive environment to our workers that would enrichen their lives is our most important goal we decided to ask our people feedback to “Why they love working for Estanc” personally and we would like to share their answers with You. We hope that you will enjoy the introductions and stories of our team members as much as we do and that it helps to understand how manufacturing service par excellence is put together on daily basis and what makes us tick. We are humbled to kick-off our series with Kristo. Kristo has been part of Estanc for 23 years. He started working for us brief 4 years after Estanc’s inception. He is working in our prefabrication department. We all know that the price of mistakes is the highest in the beginning of the projects and Kristo does his important part making sure that we stay sharp when it matters the most. His loyalty and commitment to his work are widely recognised in our team. One of Estanc’s values is #Proficiency and Kristo is a true embodiment of that. Subscribe to our Linkedin page to stay connected with our latest activities.